It's Christmas in Defiance! Two factions decided to step up a bit and offer you some nice loot if you help them with their Christmas-themed contracts. The Defiant Few Daily requires you to defeat a Major Volge Arkfall (Solstice Strike). Only after you have done this, you can collect a present at Shondu's Consulate. Please note: For the daily to count, you have to collect your present. A blue Defiant Few symbol will appear on the map at Shondu's Consulate, signaling you to pick up your present. You will receive a random purple Solstice gun. The Defiant Few Weekly requires you to complete the Daily five times. Only after, you will be able to get your bigger present: A random jackpot gun! They hide all over the world, from Mount Tam to Silicon Valley! You need to find one random reindeer per day and all 9 for the weekly, but be warned: They like to switch locations which makes them harder to find. In order to limit the locations, Defiance Data attempts to map as many reindeer sightings as possible. Please note: This map is not complete! Reindeer do not have to be at any of these locations. If you find a new location, please take a screenshot and leave a comment here or on the forums so we can add it to the map! 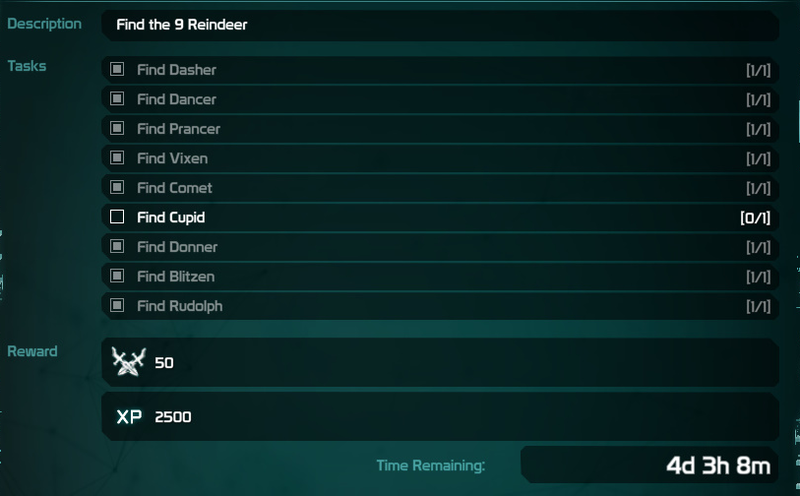 Reindeer switch their location per shard/after every server restart. Every reindeer can be at one of 4 locations, unique for each reindeer. We are trying to find all 4 locations for each reindeer, for some, we haven't yet. Of course the Tarr Family has some nice offers for you only available throughout the Christmas Event. Can you elaborate on "not working"? It's been working for me across all of my characters on different servers. You get only one gift per day, not after every major. The gift thingy is working again for me after yesterday hotfix! He moves around he was at the overpass once but he could be any where now. If you are talking about the Defiant Few Reputation Pursuit, that seems to be UI only. Phantasie posted a thread on the forums about it. Also note that the present for the weekly won't count when collecting a present for the daily. You can only collect your weekly present after you have done 5 dailies.